The fun and frivolity of Mardi Gras inevitably leads to thoughts of New Orleans, where the holiday attracts merrymakers from around the country—and world. The storied city’s reputation for delicious cuisine, innovative music, fine architecture and unique cultural traditions has even worked its way into advertising created for the City of New Orleans (Chicago-New Orleans) and Crescent (New York-New Orleans). Although today an important component of the long-distance network, the latter train did not join the Amtrak family until 1979—almost eight years after Amtrak took over most of the nation’s intercity passenger rail services. When the Amtrak system map was unveiled on May 1, 1971, the Southern Railway's Southern Crescent (New York-New Orleans) was not included. Southern Crescent is not part of the Amtrak system. Southern’s premier train was the Southern Crescent. It ran daily from New York to Atlanta, with tri-weekly service between Atlanta and New Orleans. It was created in 1970 by combining two of Southern Railway’s best-known name trains: the Southerner and Crescent. The former went into operation in 1941 as an all coach streamliner with daily service between New Orleans and New York, while the latter traced its roots to the 1890s and had generally carried Pullman Sleeper cars. New stainless steel streamliner equipment was introduced on the Crescent and Southerner in 1949. Sleeping car passengers could choose among roomettes, bedrooms and a master room (bedroom with a private shower and drawing room). The new combined train initiated in 1970 offered coaches and Sleeping cars, as well as Dining car service between New Orleans and Washington. note regarding the Southern Crescent. Under Claytor, the company maintained the Southern Crescent’s high level of customer service. Cosmetic enhancements included the refurbishment of the 1949 Crescent rolling stock and repainting of the locomotives in the Southern’s historic Virginia green and gold livery. According to the first Amtrak timetable, southbound Southern Crescent cars were attached to Amtrak Train No. 173 between New York and Washington (Train No. 126 northbound). Upon arrival in Washington, they were switched over to Southern’s diesel locomotives in order to continue the journey to Atlanta/New Orleans. South of the capital, Southern Railway designated the Southern Crescent as Train No. 1 (No. 2 northbound). The trip from Washington Union Station to Atlanta Peachtree Station took approximately 13 hours; for those riding the entire 1,153 miles to New Orleans Union Passenger Terminal, the journey lasted about one full day with arrival in the early evening. Those wishing to continue past New Orleans towards Los Angeles aboard their Sleeping car could do so via a through car that was parked overnight at New Orleans and switched onto Amtrak’s Sunset Limited the following day. Some services were limited to certain parts of the route, such as complete dining and beverage options between New Orleans and Washington but only snack and beverage service between Washington and New York. Passengers could also enjoy the scenery from a Dome car between Atlanta and New Orleans. 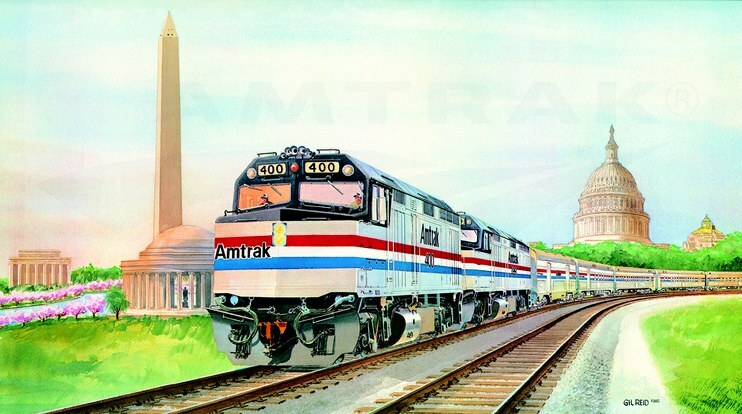 The Crescent, led by an F40 locomotive pulling Heritage cars, graced the official 1986 Amtrak calendar. 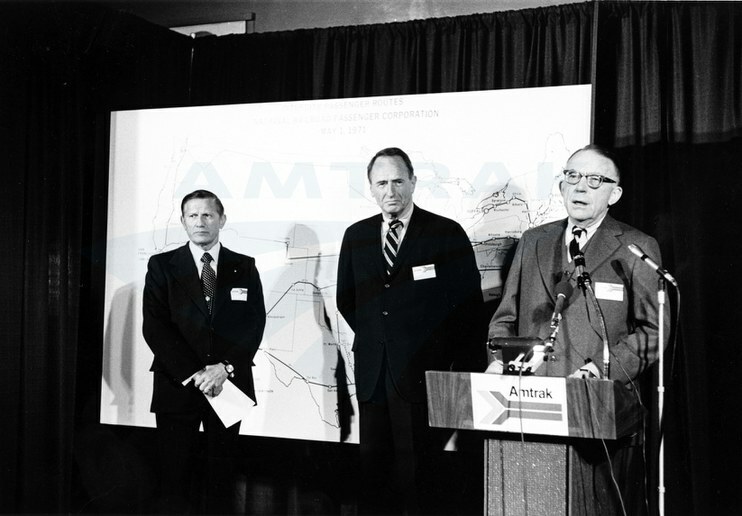 An agreement was finalized in January, 1979; Amtrak President and CEO Alan Boyd assured the riding public, “We recognize that the Southern Crescent is a regional institution and we intend to see that it remains one of America’s finest long distance trains.”7 New daily service under Amtrak began on February 1st. To celebrate the takeover of the train, now simply known as the Crescent, Amtrak launched a promotional campaign under the phrase “Southern Comforts and all that Jazz!” It not only reflected the region’s reputation for good manners and satisfying comfort foods, but also highlighted New Orleans’ international renown as a birthplace and incubator for jazz. Amtrak’s new red brochures featured a thin yellow crescent moon as a romantic backdrop to the silhouette of a man playing the trumpet and wearing a bowler set at a rakish angle. The first departure from Washington involved champagne toasts as the vintage Southern cars were pulled by Amtrak locomotives dressed in patriotic red, white and blue. Upon arriving in New Orleans on Friday night, passengers were greeted to the sounds of the Olympia Brass Band. Railfans were also on hand to document a new era for their beloved train. Amtrak’s Crescent takeover coincided with the release of a Congressionally-mandated report on a proposed restructuring of the national route system. The U.S. DOT argued that the train did not carry a sufficient passenger volume and also found that “there is frequent bus service directly linking all the stations on this route between Washington and Atlanta [and] adequate bus service directly linking all the stations between Atlanta and New Orleans…In addition, the route is paralleled for its entire length by Interstate Highways, and frequent direct air service is available between major points on the route.” Following negotiations in Congress, the Crescent was retained along with a handful of other routes originally scheduled for elimination. Amtrak later replaced the Southern’s equipment with Heritage cars constructed during the same era for other railroads that had been rebuilt to utilize head end power for heating and lighting. The Heritage coach, Sleeping and Lounge cars remained in service until Amfleet II coaches and Lounge cars, and the then-new Viewliner Sleeping cars, were assigned to the train in the mid-1990s. The Viewliner cars were the first single-level Sleeping cars manufactured in the United States since the 1950s. One of their most popular and distinctive features is an upper row of windows that allows ample natural light to enter the Roomettes and Bedrooms. The Crescent continues to carry Heritage Dining cars that will soon be replaced by newly constructed Viewliner II Dining cars; among the Heritage Dining cars still in service across the Amtrak system are three of those built for the Southern Railway in 1949. In fiscal year 2013, the Crescent carried approximately 307,000 passengers, nearly double the number it transported before the 1979 Amtrak takeover. Did you ride the Amtrak Crescent in its early years? Share your memories with us in the comments section below or share this post on Facebook! 1 Fred Frailey, Twilight of the Great Trains, (Bloomington, Ind. : Indiana University Press, 2010). 2 “Southern Goes Solo,” The [Charleston, South Carolina] News and Courier, April 30, 1971. 3 “Southern Crescent To Run For At Least Another Year,” The Spartanburg [South Carolina] Herald, August 4, 1978. 4 Robert Page, “Southern Crescent: To Roll or Not Roll,” [Lexington, N.C.] Dispatch, March 23, 1978. 5 “Crescent May Go Amtrak,” The Spartanburg Herald, May 11, 1978. 6 United Press International, “Southern Crescent pact nearer,” St. Petersburg [Florida] Times, December 8, 1978. 7 Howard Benedict, “Brock Adams will announce cuts in Amtrak,” Lewiston [Maine] Evening Journal, January 31, 1979. 8 ‘“Southern Comfort and All That Jazz’ Promotes Crescent,” The Spartanburg Herald, February 5, 1979.